Stuxnet malware attacks supervisory control and data acquisition (Scada) systems that use Siemens WinCC Scada software. The Siemens software is used by a range of critical infrastructure providers, such as utilities companies. The 14 infected locations were mostly processing plants, and critical infrastructure organisations had not been affected, Siemens spokesman Wieland Simon said. Most of the infected plants are in Germany, and no cases have been reported in the UK, he added. On Wednesday, Microsoft published a patch for the Stuxnet malware, which combines the characteristics of a rootkit, a worm and a Trojan. Siemens is advising its customers to implement the fix as soon as possible. Globally, Stuxnet has infected between 90,000 and 100,000 systems, according to Symantec. Liam O’Murchu, a Symantec researcher, is scheduled to present a study of the malware at the Virus Bulletin VB2010 conference in Vancouver at the end of September, technology publication Computerworld UK noted on Thursday. The malware has code which allows a hacker to control industrial systems, and it hides using a number of rootkits. It spreads via USB sticks using a vulnerability in Microsoft Windows. Malwarebytes’ Amti-Malware is a very popular security application, in the past few months MRG has received many requests to review this application and we have decided to do it. We want to start by saying a few words about this product, Malwarebytes’ Anti-Malware ,or as commonly referred to as MBAM, is a product specially designed to give out extra level of protection as it works right next to your primary Anti-Malware application. As this product is a complementary Anti-Malware application, the reviewing process is slightly changed to show full potential of this program. We will attempt to download and run 15 malware samples using 15 malicious URL’s with Malwarebytes’ Anti-Malware running in the background. We will attempt to download and install 15 rogues applications using 15 URL’s which are used to distribute rogue applications with Malwarebytes’ Anti-Malware running in the background..
We will run an On Demand scan on 10 samples of malware, these samples come from our Infected System Rescue test and are the ones that were missed by most Anti-Malware applications. These samples are missed, malicious, traces from the system (failed removal), EXE’s and .DLL’s form the system folder. Real Time Protection test where we will execute 15 samples of malware. Infected System Rescue test where we will infect the system with 10 samples of malware and will use Malwarebytes’ Anti-Malware to clean the system. 15 malicious URL’s – Malwarebytes’ Anti-Malwaresuccessfully blocked all 15 malicious URL’s (download nor installation was not possible). 15 rogue URL’s – Malwarebytes’ Anti-Malware successfully blocked all 15 rogue URL’s (download nor installation was not possible). Malwarebytes’ Anti-Malware detected 8/10 samples missed by other Anti-Malware applications. Malwarebytes’ Anti-Malware blocked 13/15 samples when we executed them in real time. Malwarebytes’ Anti-Malware is an extremely effective security application, it has many useful features one of which is IP blocking which works perfectly, real time protection is able to block samples which are not recognized by signature based detection (heuristic and IP). It showed us that it was more than capable of detecting, removing and blocking samples that are not being recognized by other security applications. The program is very simple to install and configure and we believe that even the lesser experienced users will not have any problems with configuration. Overall, Malwarebytes’ Anti-Malware is doing exactly what it was designed to do, it is offering extra level of protection working right next to your primary Anti-Malware application of choice, we wish to highlight its real time blocking and malware removal capabilities. All programs tested using their default settings. Full report of Rogue Software Infection Prevention test is available for download in PDF format. The purpose of this project is to assess the effectiveness of a set of five full AV/AM applications and two AM/AS applications against 1000 mixed samples on demand and their effectiveness in detecting and removing fifteen live infections from a system. 1. Windows XP Professional Service Pack 3 is installed and updated with all important updates. 2. An image of the Operating System is created with internet access. 3. A clone of the Imaged system is made for each program to be used in the test. 4. An individual program is installed with default settings on each of the Cloned systems. 5. Any real time protection is disabled. 6. On each Cloned system the folder containing the samples of malware is placed. 7. All the programs are fully updated. 8. Real Time protection and other default methods of detection/prevention used by the applications are turned on prior to the start of the test. * Prevx is limited to detecting and cleaning 256 malicious samples at a time, therefore, we performed as many scans as was required to clean all the samples it was able to detect. We used 1000 samples of malware, the samples up to one month old , only Trojans, Backdoors, Worms, Rogues, Spyware and Viruses were used. An image of the Operating System is created with internet access. 2. A clone of the Imaged system is made for each program to be used in the test. 3. An individual program is installed with default settings on each of the Cloned systems. 4. A Snapshot is taken of each cloned system. 6. On each Cloned system the folder containing the fifteen samples of malware is placed. 8. Each malware sample is executed individually, with the system being rebooted after each execution, until all fifteen samples have been executed. 9. A second snapshot of the cloned system is taken, allowing us to know all changes / infections. 10. All differences between the first and second snapshots are noted. 11. Real Time protection and other default methods of detection/prevention used by the applications are turned on. 12. The test is conducted by performing a full system scan and allowing the application to perform its detection and removal activities. 13. Once the application finds no malware / reports a clean system, the cloned system is compared to the first snapshot so an assessment of cleanup effectiveness can be made. This test is property of Malware Research Group, any unauthorized reproduction of this test is strictly forbidden. 1.Windows XP Professional Service Pack 3 is installed and updated with all the important updates. 2. Image of the Operating System is being created. 3. Clones of the Imaged system have been made in the amount of programs used in the test. 4. On each of the Cloned systems a separate program is being installed. 5. All the programs used in this test are being updated with the latest databases , the updating process is finished within 60 minutes for all programs. When the updating procedure is finished and the successful program updates have been verified, internet is disconnected. 6. Malware package that was prepaid earlier is being placed into every PC scheduled for testing. 7. All All programs were tested using their default (out of the box) settings..
8. After each program finishes the test, another scan is being performed on the undetected items. 9. When each of the programs completes the second scan, the samples missed are being counted and stored into the external storage unit. 10. The final results are presented and show the amount of samples that were detected and removed..
McAfee VirusScan Plus enables Artemis by default therefore we tested McAfee VirusScan Plus with active internet connection at the same time the other oprograms were being updated with their latest databases. The table shows the program tested, the amount of malware samples (all of the categories above) that were detected and removed. All samples of malware used in this test came from infected machines, samples were collected from 05/08/2009 – 20/05/2009. The testing was conducted from 27/08/2009 – 31/08/2009. 1.Windows XP Professional Service Pack 3 is installed and updated with all important updates. 2. An image of the Operating System is created. 4. An individual program is installed on each of the Cloned systems. 5. On each Cloned system the package containing 60 samples of malware is placed. 6. All the programs are fully updated. 7. Real Time protection/On Access scanners as well as all other methods of detection/prevention used by various Security Applications are turned on prior to the start of the test. 8. The test is conducted by trying to execute each of the 60 malware samples. 9. In this test goal is to block the execution of each of the 60 malware samples, therefore we allowed various categories of Security Applications to be used in the same test, we tested mostly Antivirus, Internet Security Suite applications with their default settings (out of the box). 10. After each program used in this test is tested on against all 60 malware samples, the system is checked for any traces of active malware. 11. We will show the list of missed malware for each of the programs which failed to block all 60 of the samples. 12. The results will be presented separately for Antivirus and Internet Security Suite applications. The tables shows: Program tested, Amount of samples blocked, Amount of Samples missed, Passed or Failed the test. Using the same engine doesn’t mean that the result is going to be the same, if the two product don’t share the same features in real time protection (heuristics, behavior monitoring…) and the samples are not covered by signature database, they results will differ. F-Secure, Microsoft Security Essentials, Prevx and Panda Cloud require a live internet connection in order to function properly. These four AVs were tested on VMs with live connections within 45 minutes of the traditional AVs Images being finalized in order to ensure they had no measurable advantage over them in terms of signature age. For all other information, please visit our forums. False Positive samples were not used in this test, therefore the results reflect strictly the detection capabilities of each program used in this test. Samples used in this test were supplied by our own team of researchers, all samples are less then one year old. 5. All of the programs in the test are being updated with the latest databases at the same time. When the updating procedure is finished and the successful program updates have been verified, internet is disconnected. 7. All the programs in the test are set to delete all the detected items. 10. The final results are presented and show the amount of samples that were detected and removed. Samples used in this test were supplied by our own team of researchers, all the samples used in this test date from January 1st 2008. up to December 31st 2008. If you wish to use these results on your website, please use a direct link to this web page. We wish to point out once again, that this test was done using malware samples created and discovered in the past year (2008. ), we did not use any “suspicious” files or False Positives, we didn’t take scanning speed into consideration, this was test was conducted simply to check the ability of today’s Anti-Malware programs when dealing with malware samples which have been around for some tome. Avira and a-squared detected exactly the same amount of samples (99.61%), that result is very rare in tests like this and has happened to our team only once before this test. Both Avira and a-squared share the first place in this test. This test is property of Malware Research Groupany unauthorized reproduction of this test is strictly forbidden. All the samples used should be detected by all the participants in this test. All the samples used are wide spread and no “unknown” variants have been used. This test was not conducted inside a virtual environment because many of the samples used in this test will not run inside virtual environments. Instead we used real conditions which are ideal for this type of the test. Before the test started MRG Team tested all the samples to check their correct installation and functionality. with all the important updates and patches. and snapshots of the system. 3. Extra images of the system are being created. of the system is being created after each infection took place. 5. The malware installed on the system is being checked for proper functionality. made for each of the 30 samples used in this test. infections as well as system functionality (another image is being created). if the system is not harmed while the disinfection took place, the program gets one point. place, the program will get no points. 10.System Rescued award goes to all programs that achieved 100% successful removal of all the active infections. The Table shows the name of the program used, how many points the program got and the final result. This test is property of Malware Research Group any unauthorized reproduction of this test is strictly forbidden. List of the programs that failed to remove all active infections, under each program you can see which malware samples were not successfully removed. All the programs managed successful installations on all the infected images, none of the programs harmed the system while removing malware from it. SAMPLES USED IN THIS TEST WERE SUPPLIED BY OUR OWN TEAM OF RESEARCHERS. 6. Malware package that was prepaid earlier is being placed into every PC scheduled for this test. 10. After the missed samples have been verified, 20% of the missed samples are being anonymously submitted to each of the program Vendors. 11. The final results are presented and show the amount of samples that were detected and removed. The table shows the program tested, the amount of malware samples (all of the categories above) that were detected and removed and the amount of Adware and Spyware samples that were detected and removed . These are the most popular malware threats on the internet. FBI Special Agent Conor Phoenix, a coordinator in the New Haven Computer Crimes Task Unit, will speak on September 27 at the New Canaan Library at 7:00 P.M on Globalized Cyber Crime. This free program is part of the Great Decisions series. International cyber crime creates new challenges for the US. The remote nature of cyber crime places new challenges in a world governed by jurisdiction and the weak laws of neighboring states. Yet with the explosive growth of internet worldwide, computer crimes increasingly are prone to have international dimensions. Agent Phoenix will speak to these issues. Great Decisions, a program of the Foreign Policy Association, is presented by the World Affairs Forum, whose mission is to expand understanding of global affairs and America’s role in the world. Malware Research Group will begin conducting Flash Tests on Monday January 24th. The list of participants will be finalized in the next 72 hours. We will publish the list of participants as well as the new methodology before the first test is published. Over a million websites were compromised by malware in the second quarter of this year, according to a report from security firm Dasient. The report was compiled from the company’s telemetry systems which, it claims, monitor millions of websites daily. The figures are then extrapolated to render infection rates across the internet. Malware attacks appear to be rising at a rate averaging around 24 per cent according to the numerous research figures on the internet. Dasient’s own figures show 56,000 websites poisoned at the end of last year followed by 720,000 in the next quarter. With the new figure of 1.3 million the trend seems to be a rapidly rising curve. Malvertising is an area of concern, according to the research team. Malicious online advertising, or malvertising, is an area of concern, according to the company. They look like harmless adverts but deliver malicious code when they are clicked on or lead the victim onto a more treacherous website. It was estimated that 1.6 million malvertisements are served every day. Usually, the website owners soon eliminate them but the attackers have discovered a way to gain time. By posting the ads at the end of the week they usually have a few days before a webmaster comes anywhere near the site and then the malvert has to be discovered. The researchers reckon that the average malvertising campaign can last for 11.5 days before being eradicated. A further 42 per cent of sites use advertising-related resources to manage their own in-house ads or to show third-party ads on auxiliary sites. Even financial websites have been known to fall for this but the main villains are publisher sites. COMODO Internet Security is a fast growing, constantly improving, freeware product which provides 360° protection. COMODO’s motto is “Prevention is the key to internet security”, we absolutely agree with this, so we decided to use COMODO Internet Security in our multilayered test. Making this review we used the latest version of COMODO Internet Security (3.12.111745.560), Database Version: 2470. 2. Self Protection test where we used various tools with which we tried to disable COMODO Internet Securityand its services. 1. On Demand scan test – COMODO Internet Security failed to detect 153 samples of malware out of 50.000, scoring a detection rate of 99.69%. 2. Self Protection Test – COMODO Internet Security successfully blocked all 10 attempts to disable it and its services. 3. System Protection Test – COMODO Internet Security successfully detected and blocked all 15 System Killers leaving the system unharmed and fully operational. COMODO Internet Security offers outstanding level of protection with their default settings, we were impressed with their Defense + and its ability to successfully block all attempts to disable it and harm the system. This product offers outstanding Proactive Protection, excellent Leak Protection, On Demand scan speed is impressive, program runs very lite and uses very little of system’s resources. As we are following the development of COMODO Internet Security we are able to see improvements made, we only hope that they will find a way to reduce the amount of popup screens which will make it more user friendly for the lesser experienced users. Prevention is the key to internet security and COMODO is taking that seriously. Malware Research Group is adding another type of test to our existing tests, Real Time protection test. As we believe that prevention is the most important part of the battle with malware, we will encourage these tests more often then other tests as they will show much clearer picture on how Anti-Malware applications deal with blocking new samples of malware in real time. In these tests we will pick the samples from the list of most distributed malware (trojans, backdoors, worms, rootkits, exploits…. ), we will attempt to run those samples and try to infect the system (like in the average everyday scenario when users get infected), Anti-Malware applications that will be used in this test must block all the samples from running, it is as simple as that. For every application tested and all the samples used we will monitor the system for any changes, detecting a sample doesn’t necessarily mean that the sample is really blocked from running, as we have conducted similar tests in the past many times malware is found actively running after it was detected and “blocked” by the tested application. If any traces of the infection is found running after the test is completed (for every sample separate), the application tested will fail this test. Only those applications that manage to block all samples from running and no traces of the infection are found in the system will pass this test. The amount of samples that we plan to use in this test is not yet set, but we are thinking of using about 50-80 samples per test, as these tests will be performed more frequently there is no need to use larger number of samples. We first came across BluePoint Security about six months ago and thought at the time it seemed an innovative product. We have included it in our tests and it performs very well, in fact, it is an exceptional product, as is demonstrated by its performance in our last official test where it was the only full antimalware product to pass. We have mentioned before about the increasing amount of malware being produced and the efforts of security vendors to keep up with this. One popular means employed by vendors is cloud technology which allows vendors to react to new malware faster and protect their customers against these threats more quickly. Whilst cloud technology helps increase detection efficiency, it still fails to solve the problem of protecting users from zero day threats. The fundamental problem with traditional antivirus / antimalware applications is that they use black listing. This approach is somewhat like the law, which states you are innocent until proven guilty. This philosophy may be great for use in Human law, where it is rightly argued it is better to let ten guilty men go free than execute one innocent man, but not so good when applied to computers. BluePoint Security 2010 takes a different approach in that it assumes all files are guilty – it intercepts the execution of every file on the system (on the premise that no file should be trusted) and checks it against a list of files it knows to be good. If the file is on its known good list, it allows it to execute, if it is not on the list, with default settings, it is then analysed using its cloud AM engine. If it is found to be malicious, it is blocked, if it is not found to be malicious, the user is given the option to allow the file to be run, with the caveat that the file is unknown. If the user chooses to execute the file, BPS will continue to analyse the file to detect malicious behaviour. If BluePoint is set to not show alerts, the user is not given the opportunity to execute a file if it is unknown or found to be malicious. This approach ensures zero day or unique / custom malware is always blocked. 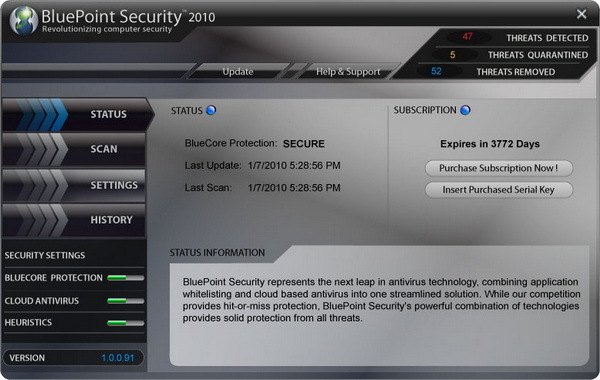 BluePoint Security 2010 was reviewed on a system running Microsoft Windows 7 (32 bit). As BluePoint Security 2010 requires active internet connection to function properly because of their cloud based technology, internet connection was active during the review process. 1. System Protection Test: we used live URL’s to download 50 Zero-Day malware samples and attempt to infect the system with them. 2. System Protection Static Test: in this test we used 50 samples of malware which were downloaded before, all files are being executed in real time. 3. Infected System Rescue Test: we used BluePoint Security 2010 on a system containing 10 active infections (Buzus, Hupigon, Inject, Koobface, Zbot, Bifrose, Pincav, Mudrop, Renos, Sasfis). System Protection Test: BluePoint Security 2010 successfully blocked all 50 Zero-Day samples from installing in real time. System Protection Static Test: Blue BluePoint Security 2010 successfully blocked all 50 samples of malware from installing on the host system. Infected System Rescue Test: BluePoint Security 2010 successfully remove all 10 active infections from the host system leaving no malicious/harmful traces behind. BluePoint Security 2010 showed some remarkable protection capabilities scoring 100% in all three stages of our reviewing process. From the moment you install BluePoint Security 2010 it’s a smooth ride, it makes you feel like you have no Anti-Malware program at all, but make no mistake as soon as the real threat comes it is blocked instantly. In using their “Bluecore” white list technology and complementing this with the best cloud antivirus engine we have seen to date, Bluepoint offers exactly the kind of protection users need these days. The user interface is very clear and intuitive, the setting are also very simple. The product comes set with high settings by default so there is no need for any additional configuration. Upon detection BluePoint Security will show you the risk level (low, medium, high, severe) and if malicious the files will ether be deleted or quarantined.